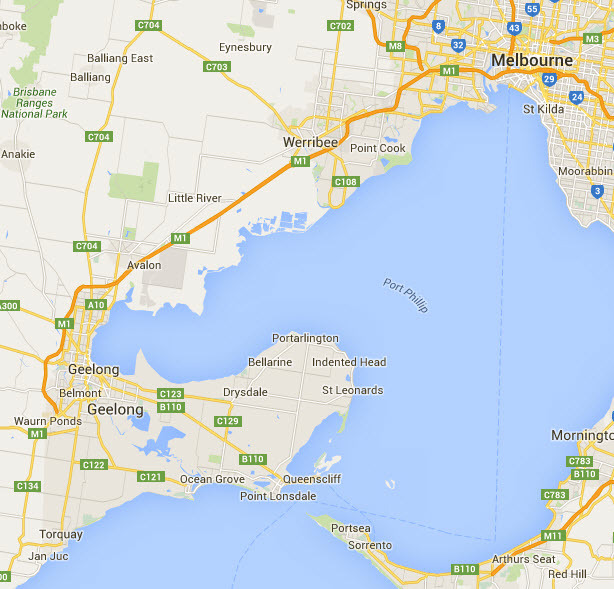 Located 75 kilometres (47 miles) south-west of Melbourne on Corio Bay and adjacent to the Barwon River, the Geelong area was originally occupied by the Wathaurong tribe. White settlers began to move to the area after 1926 and by the time it was surveyed in 1838, the township comprised a church, hotel, store, wool store, some 80 houses and a population of over 500. In 1840 a post office was established, and by the end of the decade the town’s theatrical life was reportedly thriving, with several theatres having been built or preexisting buildings converted into entertainment spaces. 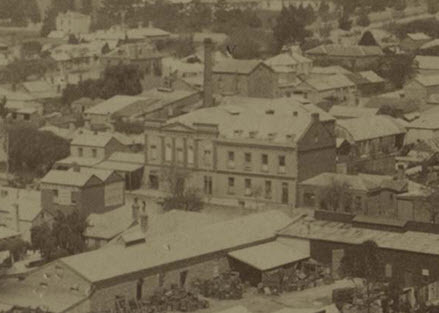 As the main port main port servicing the Ballarat region, Geelong experienced a boom during the 1850s/1860s goldrush and later maintained economic and demographic growth for a almost a hundred years as one Australia’s largest manufacturing centres. Being so close to Melbourne and with a large population Geelong was popular with touring theatrical companies and entertainers – both local and international. Many Australian variety entertainers have had a connection with the city, being born, raised or resident there at some stage. Among the practitioners known to have been born or raised there are music director H.T. Harrison, entrepreneur Harry Salmon, actor/director Oscar Asche. and actor Olly Deering. The “father of Australian theatre” George Coppin had success in the town (as lessee of the Theatre Royal in the early to mid-1850s), as did a number of other pioneering actor/managers, including Henry Deering. After arriving in Australia in 1855 scenic artist John Hennings spent time in Geelong, while many variety entertainers are recorded as having made their professional debuts there. Geelong was proclaimed a city in 1910. A short-lived theatre converted from wooden storerooms, the Albert Theatre was established by actor Thomas S. Boyd and opened on 19 December 1844 with a farce (Rendezvous) and a selection of ballads, comic songs and dances. This format remained the theatre’s staple entertainment, albeit with the principal attractions alternating between melodrama, comedy, tragedy, and farce. On several occasions the programme included at least two dramatic works in addition to the variety items. In early February 1845 fellow actor Mrs L.D. Murray took control of the theatre under somewhat controversial circumstances and continued to produce entertainments there until 18 March. The lack of facilities and auditorium space was largely responsible for it being abandoned thereafter. 1: See the Geelong Advertiser for details regarding Mrs Murray’s takeover of the theatre – 12 Feb. (1845), 2 • 15 Feb. (1845), 3 • 26 Feb. (1845), 1. 2: In addition to Boyd and Murray, other key performers associated with the theatre were Mr Richards (music director), Mrs Richards, J.L. Jacobs (actor/stage manager), Mr Serle and Mr Capper. 3: The State Library of Victoria’s “Australian Manuscripts Collection” holds a program for the 19 December production of Rendezvous. Printed on silk, it is earliest item of this type held by the Library. 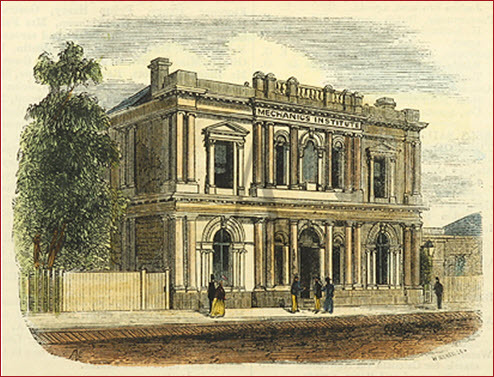 Geelong’s first Mechanics Institute was built in 1846 but by the mid-1850s was deemed too small. A new building was commissioned in 1855 and given its official opening soiree on 18 March the following year. Geelong’s increasing population over the coming decades saw the committee give at a second story in 1868. The Institute continued to play a major role in the community’s social and educational life until 21 June 1926 when the building was destroyed by fire. The Institute was favoured by minstrel companies from the 1870s onwards, but during the course of its lifetime it also hosted vaudeville, musical and comedy companies, pantomime, drama (including Shakespeare), opera and moving pictures. 1: Among the numerous variety companies to play the Institute were some of the most influential blackface troupes to tour Australia, including the Christy Minstrels, Georgia Minstrels, Kelly and Leon’s Minstrels, U.S. Minstrels, Weston and La Feuillade’s Minstrels, Cheevers, Kennedy and Bent’s Minstrels, Hugo’s Buffalo Minstrels and Emerson’s California Minstrels. Harry Rickards also leased the Institute at various times. 2: Although the auditorium was largely used as a venue for moving pictures during the 1910s and 1920s, theatrical entertainments were still held there, including productions by the Geelong Musical Society. The 1926 fire, which occurred the morning before Alan Wilkie’s Shakespeare Company was due to open, destroyed some £4,000 worth of scenery, props, costumes and personal items. Built by hotelier/brewer Henry Elmes and opened on 27 November 1848, the Theatre Royal was soon afterwards leased to actor/managers Henry Deering (1852-53) and George Coppin (1853-56). With Geelong’s port serving the nearby Ballarat gold fields Coppin accumulated much money from his involvement in the theatre. It was later managed by Messrs Young and Hydes, then George Meadows but struggled to compete with venues like the Mechanics’ Institute and in 1868 Elmes put the theatre and adjacent Royal Hotel up for auction. Local licensee Isaac Hodges reportedly operated the complex as a brewery for a period but it fell into disuse by the early-1880s. The Salvation Army occupied the building from 1884, and presented public film screenings there during the early 1900s. 1: The Royal Theatre and Royal Hotel were reportedly built by Henry Elmes (1805-1883) in partnership with J. Olive. They also built a small brewery at the rear. As with George Coppin, Elmes prospered during the gold rush era and subsequently amassed a fortune speculating in land. He eventually moved to Tasmania. The Royal Hotel site is now occupied by Officeworks. 2: During its three decades as an entertainment venue the Theatre Royal hosted all manner of theatricals, including operas, operettas, dramas, comedies, pantomimes, minstrel shows and local community and official events. It was used, for example, as the first meeting place for the newly formed Geelong Town Council in 1850, when Alexander Thomson was elected Mayor. 3: Among the earliest minstrel companies to play the Royal were the Backus Minstrels and Alpine Minstrels (both 1856). The last performances there were staged by the Star Company (“direct from Melbourne”) in late March 1865. Image: The old Theatre Royal and Royal Hotel building, Geelong (ca. 1902). Source: Geelong Heritage Centre.